This was just torture to listen to. It was just hours of pretentious, repetitive whining. I wasn't rooting for a single character in this. Great premise, TERRIBLE writing. This novel is both romantic and disturbing at the same time. It is masterfully and uniquely written in the second person. If you enjoy watching television shows like "Snapped" and the "Investigation Discovery" channel, then this read is right up your alley! The style Does take some time to get use to but once you do, it is wonderful!! I listen to 2 audiobooks a week and this narrator was by far my favorite ever! I couldn’t wait to finish this book and was sad once I had. Great read! Love it. it takes a while to get used to the style but it? worth it. Wow. This was fun to hear - the narrator was awesome and made Joe totally come to life! It’s scary when you can’t help but like the Psycho-Path... it’s even scary when the narrator reads him so well that you find yourself- dare I say it- turned on by him! Good story- different take with some steamy romps and chilling details. Would recommend for someone who likes a bit of edge and has a dark sense of humor. I hope this makes it to the screen! 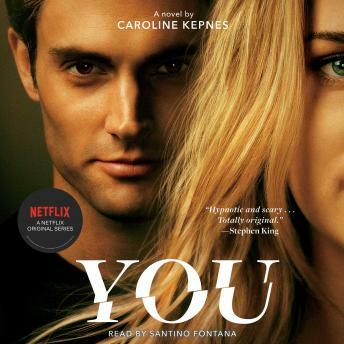 Caroline Kepnes is an amazing author. Not for those who get offended by vulgar language. Strangely addictive, hypnotic narration, eerily creepy, but oh so good! Fantastic!! The narrator nails it! Strangely addictive! So on point, this book is on SK's top fav list for a reason. I was captivated. I've never really been one for audiobooks but I absolutely enjoyed it.